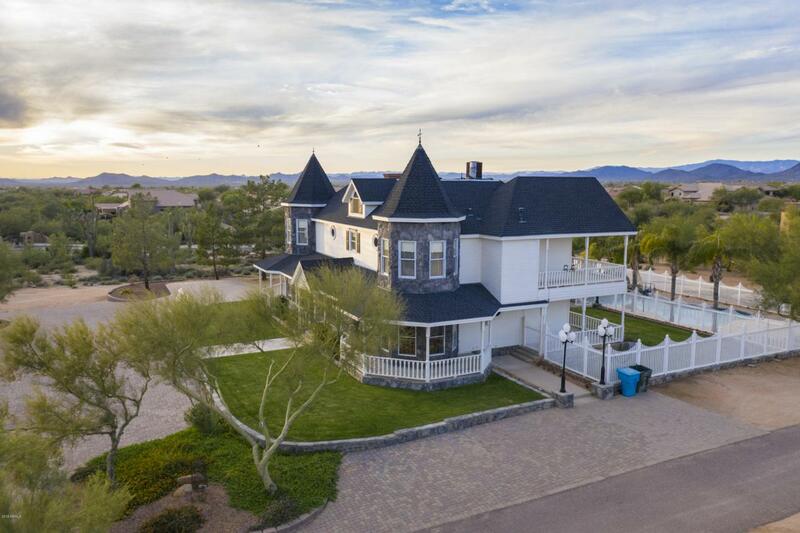 4 Bedroom/No HOA/ 85331 Victorian Custom built home in 1998 with true Victorian flare throughout this beautiful elegant 3 story Estate. Acents of Old meets new with Quartz kitchen counters, custom Cherrywood flooring on the sweeping stairs and all of the second floor so meticuously maintained throughout. Soak in the clawfoot bathtub in your relaxation room that is surrounded by high ceilings and views surrounded by mountains and city lights. Custom touches resound throughout, lighting, bath features, boulder waterfall splashing into the swimming pool, dual pane windows, crown molding, tin ceiling in all the right places and privacy and Mountain views. Gate and Road are split with all 4 lot owners. Listing courtesy of Shields Regal Realty.